You can remove a hyperlink from a single address, remove many links at once, turn automatic hyperlinks off, and turn off the requirement to press Ctrl to follow a hyperlink. To remove a hyperlink but keep the text, right-click the hyperlink and click Remove Hyperlink. To remove the hyperlink completely, select it and then press Delete. ﻿Select the cell containing the hyperlink. Press CTRL+C to copy the hyperlink. ﻿Right Click and paste using the Values paste option. 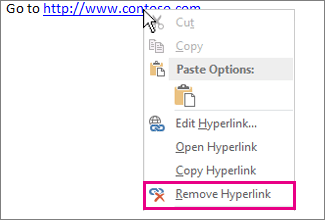 If you're using Word or Outlook, or Excel 2010 or later, you can remove all hyperlinks in a file by using a keyboard shortcut. Press Ctrl+A to select all text. Select all cells that contain hyperlinks, or press Ctrl+A to select all cells. Right-click, and then click Remove Hyperlinks. By default, Word and Outlook require you to press Ctrl when you click to follow a hyperlink. This extra step keeps you from accidentally going to a linked destination while you’re editing a document. In Word 2010 and later, click File > Options > Advanced. In Word 2007, click the Microsoft Office button > Word Options > Advanced. In Outlook 2010 and later, click File > Options > Mail > Editor Options > Advanced. In Outlook 2007, open a new message and click the Microsoft Office button > Editor Options > Advanced.